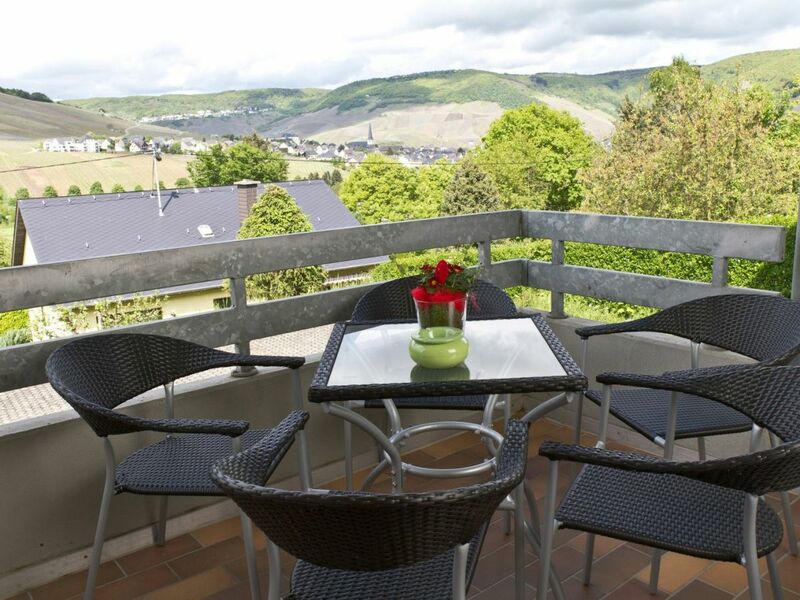 Holiday apartment "Bernkastel Moselle Panorama"
The spacious modern furnished holiday home is located in the Andel section of Bernkastel in the immediate vicinity of the vineyards and forest. 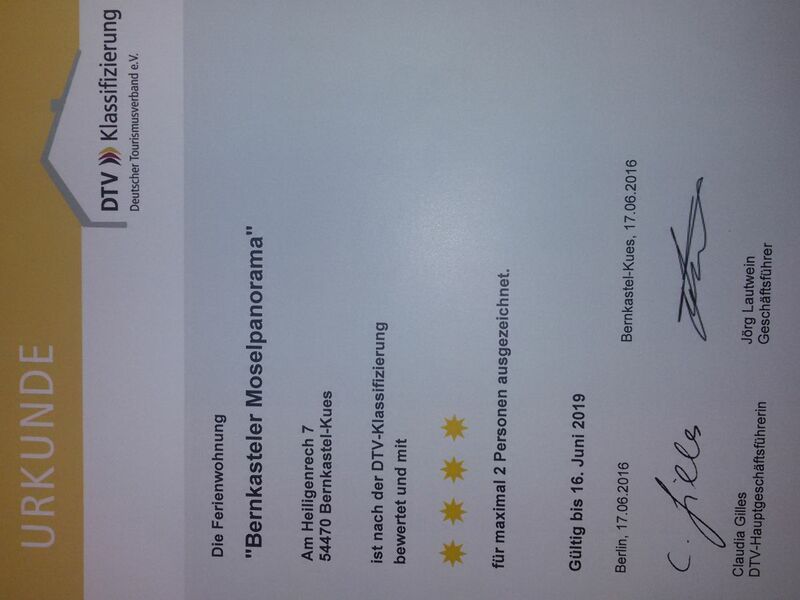 It was awarded 4 **** by the DTV: "High quality overall furnishings with high-class comfort". 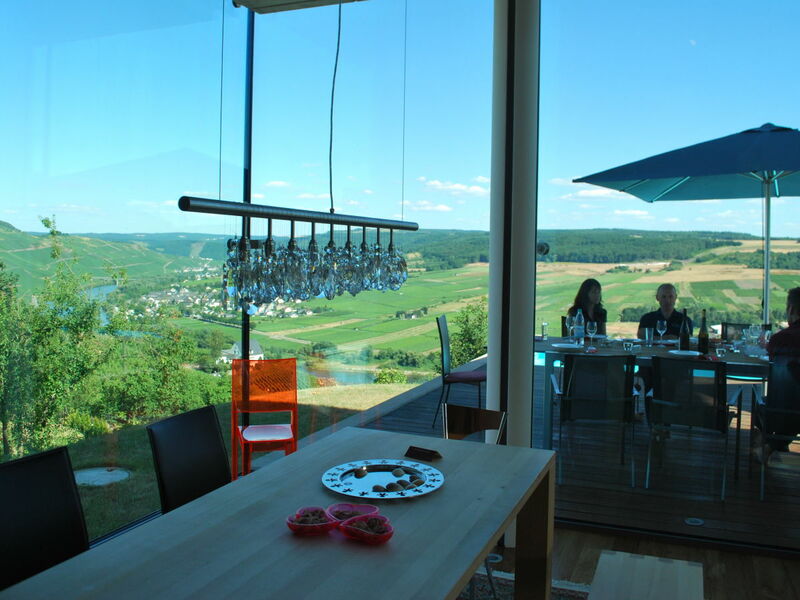 From the balcony and the light flooded living room/diner, you have a wonderful panoramic view over Bernkastel, the vineyards and Landshut Fortress. 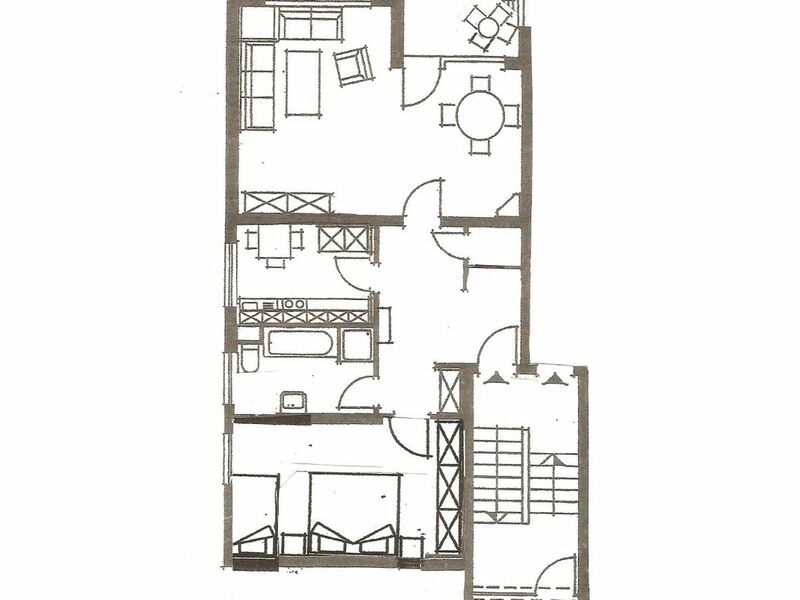 You can really feel at home in the 76 m2 of living space. We can also set up a crib in the bedroom as needed. 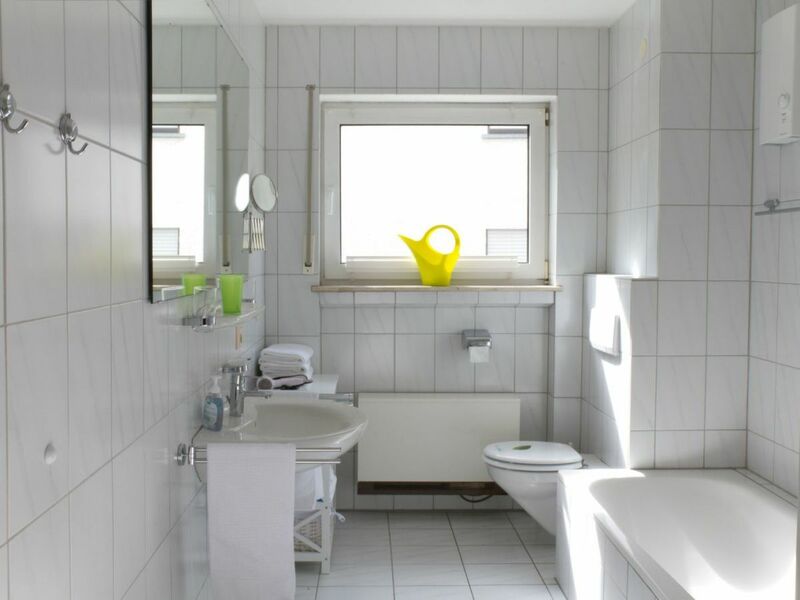 The bathroom has a shower and a bath. Parking right in front of the house, there is plenty of space for bikes in the basement. 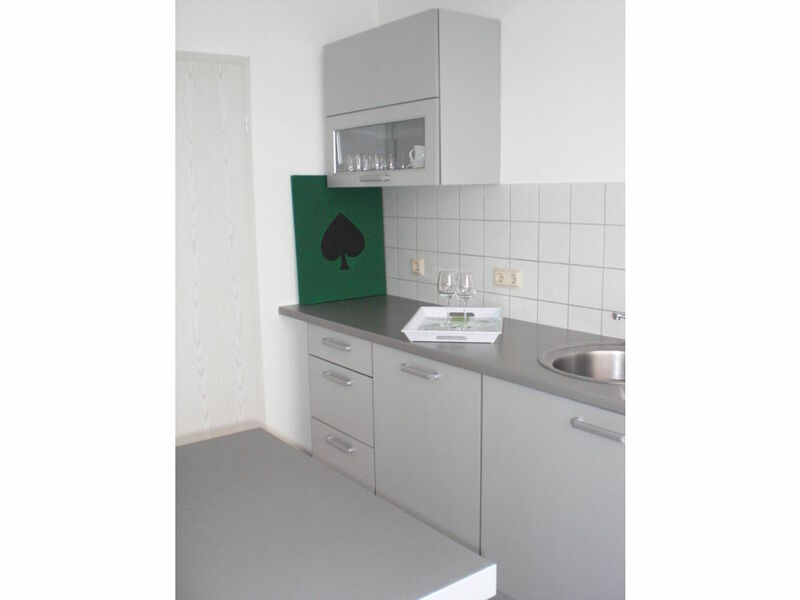 The apartment is in a quiet location in a dead end street, perfect for relaxation. 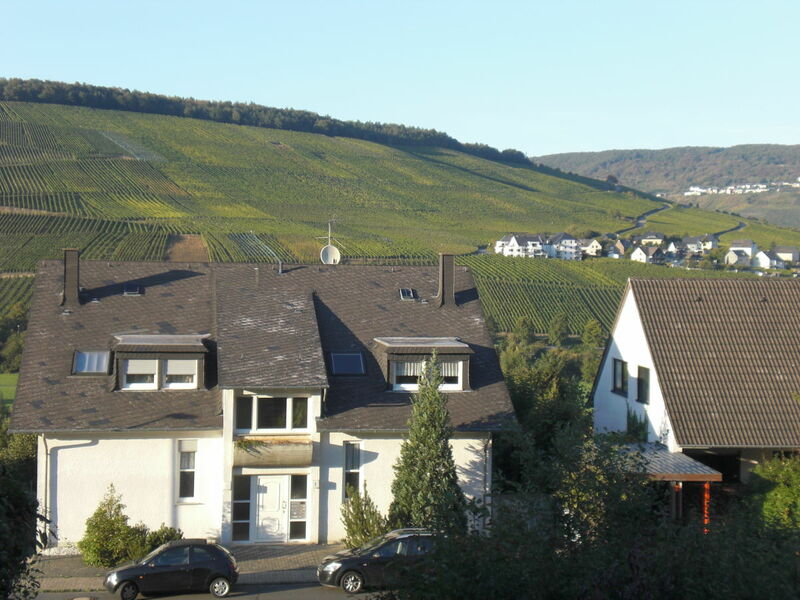 You find yourself in the midst of the greatest continual Riesling cultivation area in the world. 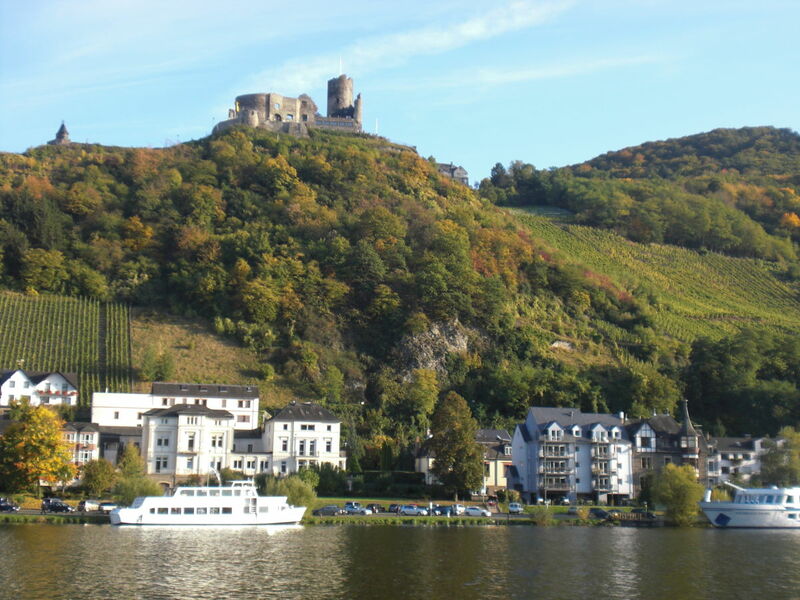 Wine tastings also in extraordinary locations, city tours, such as with the "Bernkastel Doctor" or a night watchman, canoe rentals, flights with a float plane in Andel, tandem skydiving, skate park, stables, numerous wine and street festivals. 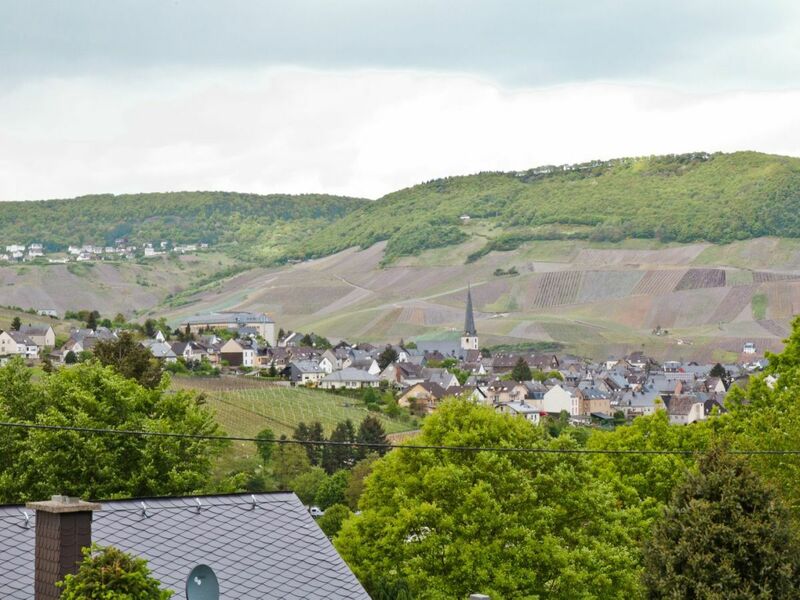 You can enter the Nordic walking park right on the doorstep, as well as many walking paths, such as into the themed hiking route "Dukes, Gold and Black Peter", which leads along the Goldbach in Andel to the gold prospecting site. 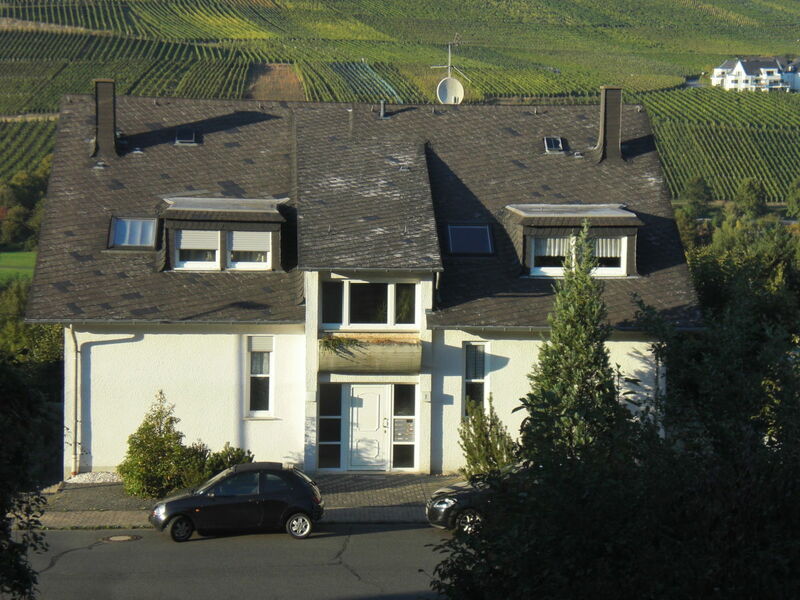 The Andel winemakers have lovely Riesling wines and sparkling wines as well as typical Moselle cuisine in their wine taverns. 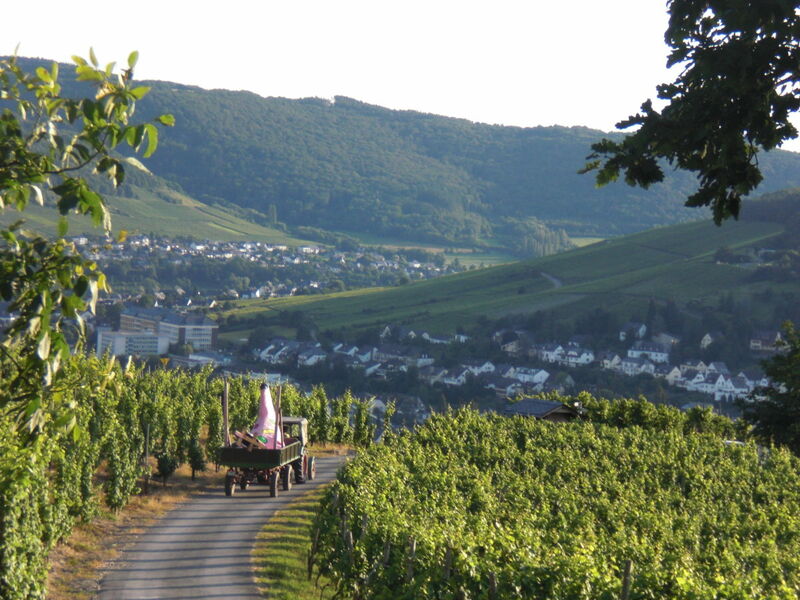 BY bike you can cycle along the well developed cycling network along the Moselle and over the popular Moselle-Maare cycling path to the Volcanic Eifel. 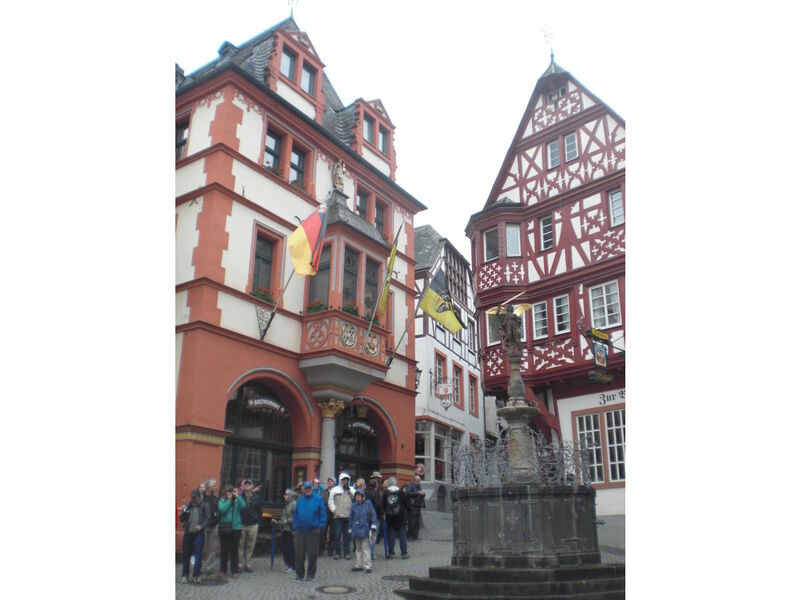 By foot you will be in the medieval Bernkastel old town in 20 minutes. There are many options for discovering it, as there are clues and testimonials from over 700 years on all corners and facades. 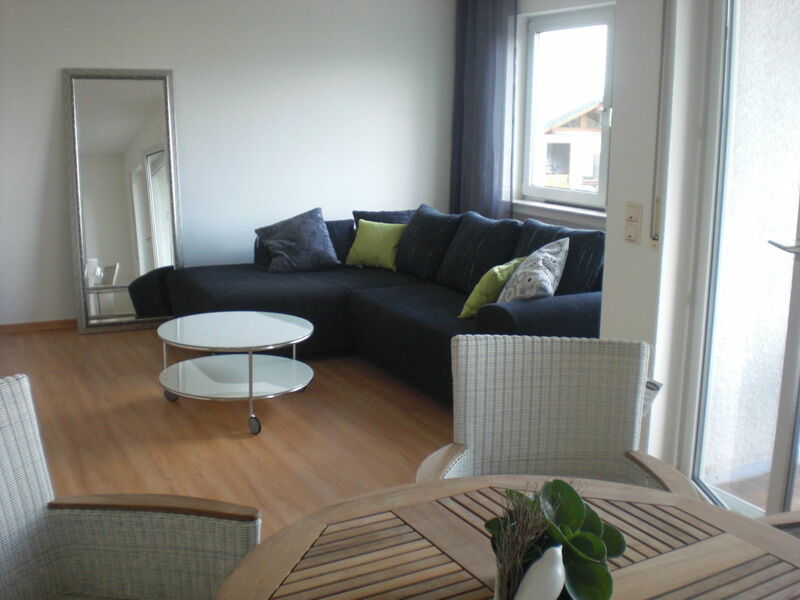 The prices are for occupation by 2 persons for a booking of one week. 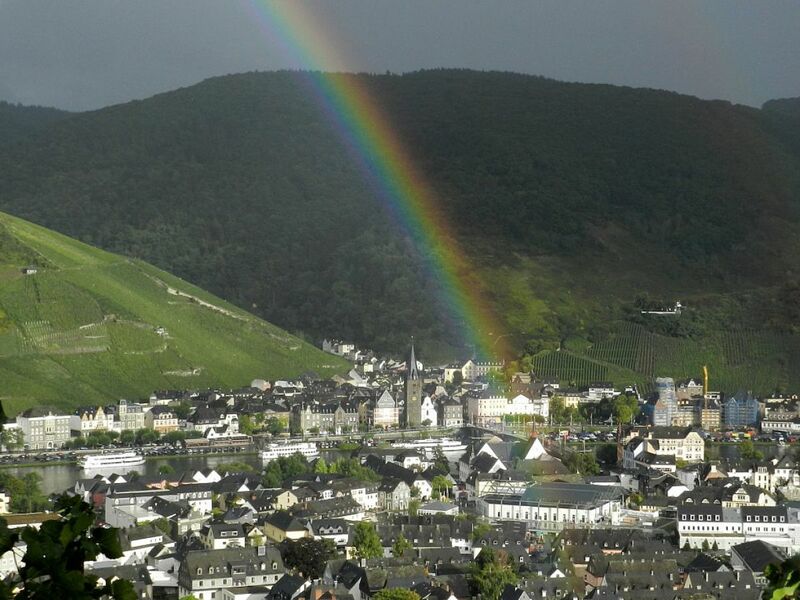 In einem Nebenort von Bernkastel-Kues, sehr ruhige zum Entspannen geeignete Gegend. 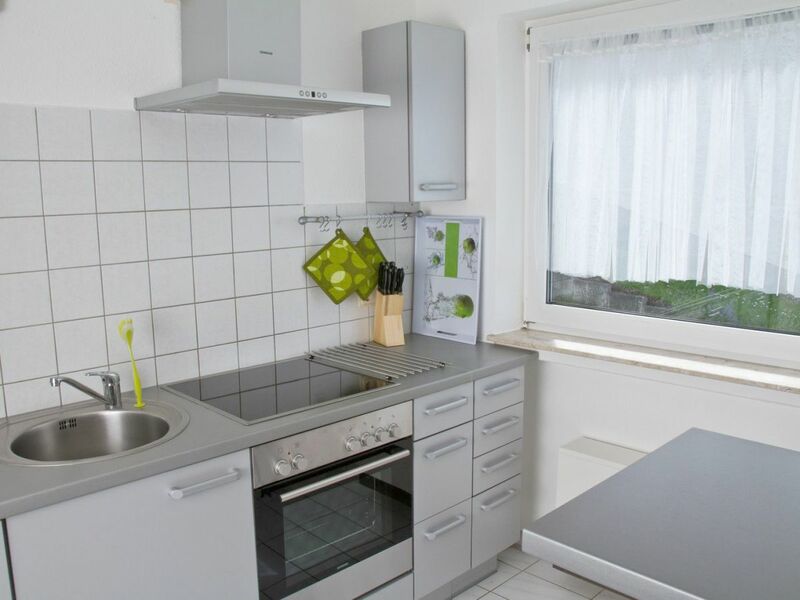 Die Wohnung ist hell und freundlich und perfekt eingerichtet. Besonders möchte ich den freundlichen Kontakt zu der Vermieterin, Fr. Dr. Bastgen erwähnen, der sehr daran gelegen ist, daß Ihre Mieter sich wirklich wohlfühlen. Wir können die Wohnung wirklich weiter empfehlen. 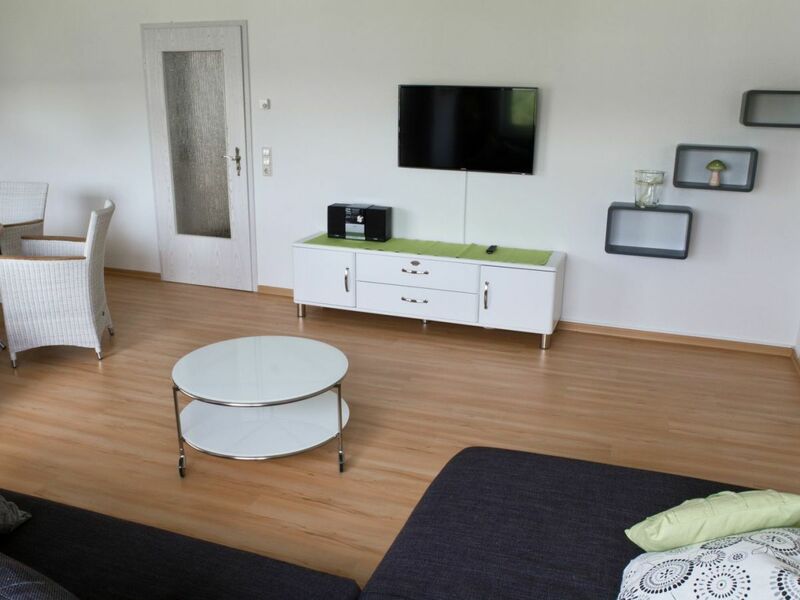 Ihre Ferienwohnung hat uns sehr gut gefallen. Sie ist geschmackvoll eingerichtet und es war alles perfekt. 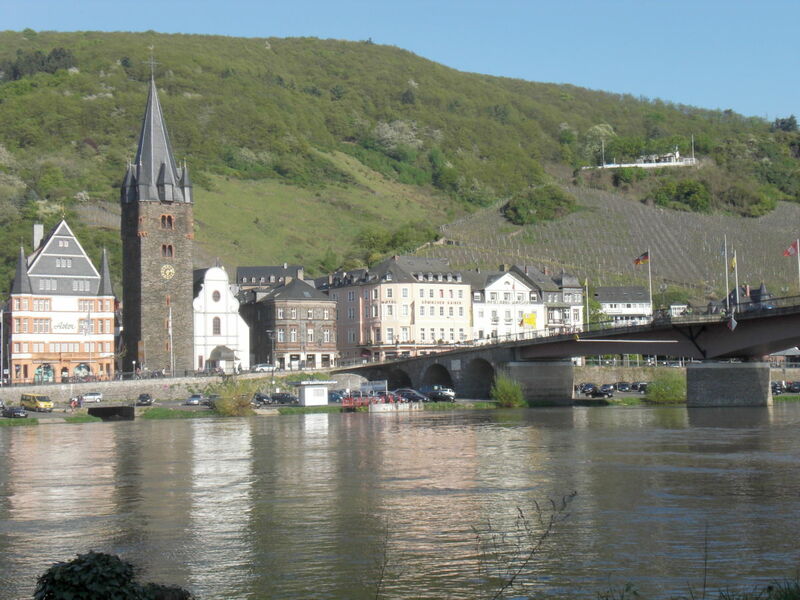 Der Blick auf die Burg Landshut, die Weinberge und Mosel ist wunderschön! Wir sind viel gewandert und haben den Moselwein genossen. 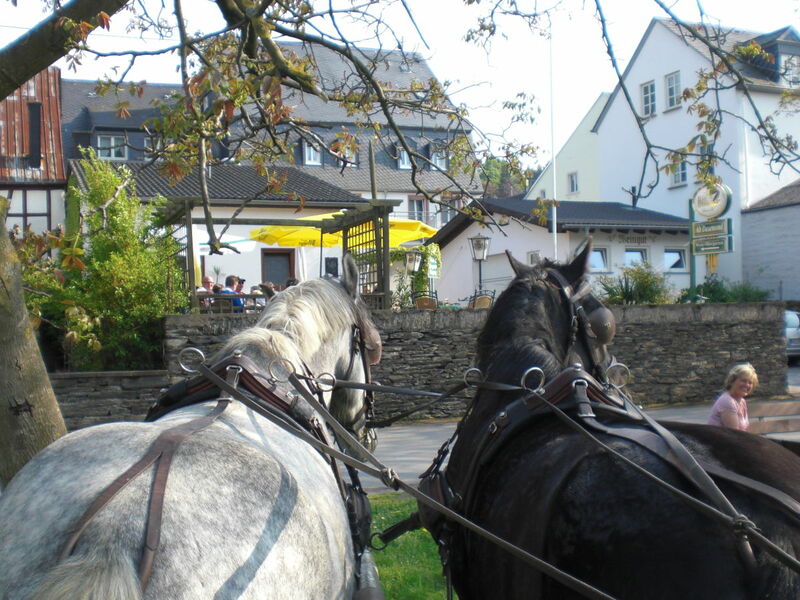 Ich danke für die sehr schöne Unterkunft und hoffe, bei einer nächsten Visite wieder in Ihrer Ferienwohung Moselpanorame einkehren zu dürfen. 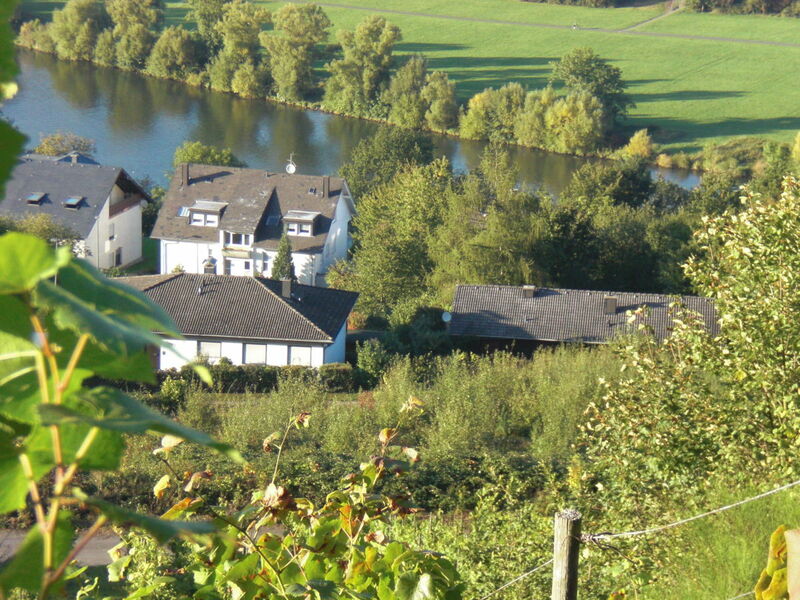 Wir haben wunderschöne Tage an der Mosel verbracht. Die Unterkunft ließ keinen unserer Wünsche offen. Modern eingerichtet, großzügig gestaltet, alles tip top sauber und gepflegt. Der Kontakt mit Frau Dr. Bastgen war unproblematisch, sehr freundlich und unbürokratisch. Schade, dass es schon vorbei ist aber wir kommen auf jeden Fall gerne wieder! 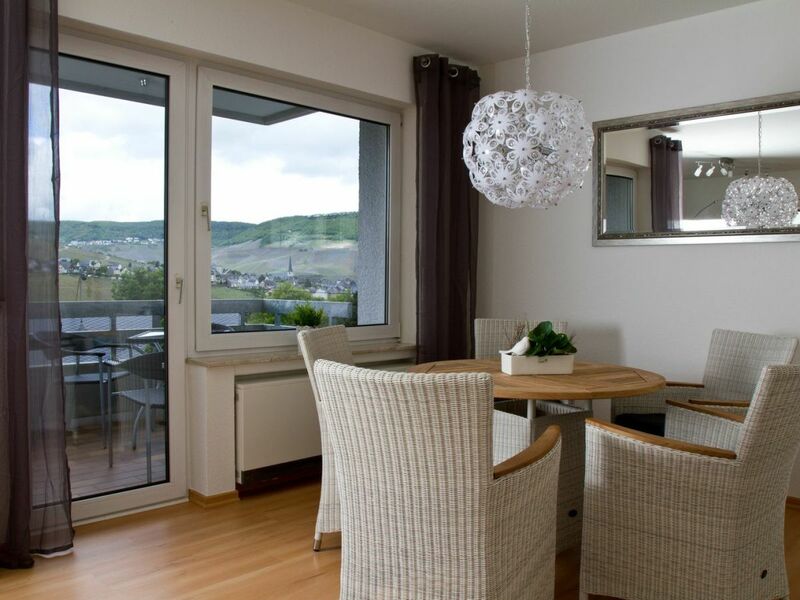 Name: Holiday apartment "Bernkastel Moselle Panorama"
"Holiday apartment "Bernkastel Moselle Panorama"" achieves a review of 5.0 (ranking scale: 1 to 5) due to 3 entered reviews.